One of the most neglected aspects of exercise, and perhaps one of the most important, is stretching. Active stretching generally involves moving a limb through its full range of motion to the end ranges and repeating several times, in order to reduce the muscle tension that results from contraction during exercise. The importance of stretching is often underestimated. Most of us are keen to rush off after a workout and get on with our busy lives, but stretching is an essential part of any workout routine, whether it’s just plain cardio, or High Intensity Interval Training (HIIT), or resistance training. Stretching exercises are not only beneficial after intense workouts such as cardio, HIIT and resistance training, but can also become everyday stretches to increase flexibility. 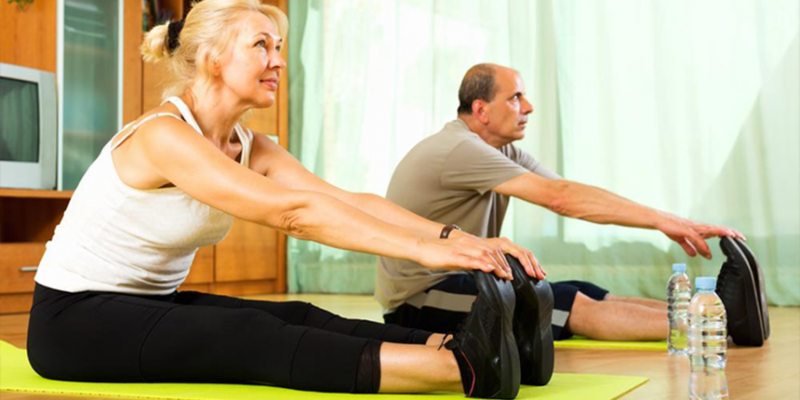 Exercises to improve flexibility can benefit people of all ages and fitness levels. With consistent post -workout stretching, the body becomes more flexible. It will become easier to bend, stand, squat and do a host of other flexibility related exercises. It has been seen that leg stretches done after a long run increases muscular power and endurance especially for runners. 1] Reduces Soreness and Tension in Muscles, Improving Flexibility. During a workout, muscles are constantly contracting. Stretching them out helps muscles return to their comfortable, relaxed state, improving their flexibility and ability to move through their full range of motion. Stretching helps muscles work optimally. Stretching exercises help the body cool down and the heart rate return to normal, helping the muscles to start repairing themselves. Lactic acid build-up in the muscles during intense exercise, along with the micro-tears in the muscles, adds to soreness and fatigue. Stretching exercises breaks down this lactic acid and helps the muscles start repairing themselves. To improve range of motion and overall flexibility of the body, the muscles, tendons and other connective tissue around joints must also be stretched. Flexibility stretches for the joints are just as important as they are for muscles. Stretching can have psychological benefits too. It is a time to relax the mind, concentrate on breathing and release tension in the body. Keeping your body supple and flexible increases blood flow and improves overall circulation, which can help protect the body from illnesses such as cardiovascular disease, diabetes and dementia. It also makes the body quick to respond to commands from the brain regarding the environment, and so avoid danger and injury, both in and out of the gym. Along with strength and endurance, flexibility, ranks as an important component of health-related physical fitness. Flexible joints enable the muscles to work to their full potential, whilst utilizing less energy. This will enhance performance in all sports and all types of exercise. From carrying a loaded laundry basket to dusting the ceilings and carrying the baby, being flexible helps you perform practically any activity involved in day to day life. You’ve seen the professional cyclists with the hunched shoulders. Very often, our workout routines neglect posture altogether. Stretching will also make us more conscious of our posture, and, although sometimes all we want to do is slouch, it may get us into the habit of sitting up straight. There is endless advice available on how to improve flexibility by stretching, both in gyms and on-line. Here are just a few exercises to help that body loosen up! Lunge right leg forward, so right knee is bent 90 degrees in front of you, right foot is flat on floor directly under knee, with left knee on the floor and left leg bent underneath you. Place both hands on top of right knee and press back hip forward, leaning into stretch, keeping torso upright. Hold for 30 seconds; release. Do three reps; switch legs and repeat. Sit on floor with an upright posture and legs extended in front of you. Rotate ribcage to right and lift ribcage off hips to rotate further to right, growing taller. Twist round as far as possible. Return to centre; repeat to left to complete one rep. Do 10 reps, holding final twists for 30 seconds each. So if you think your intense workout program is enough, think again. Without releasing the tension and making your body supple and flexible, the benefits of your exercise will be short-lived. But despite all the benefits, you must not to overdo your stretching. Overstretching can cause strains, sprains, and dislocations. Listen to your body, move slowly, and breathe. A quick overextended stretch is more likely to result in injury. A gentle longer stretch after your workout will enhance your flexibility in a healthy gradual way.